Greg Thompson in "3 The Dale Earnhardt Story"
How cool is this? I just stumbled upon this site and am blown away. Congrats to all - what a great group of people. Everyone involved had such a great spirit about them and gave it everything they had. I am most grateful to be included in such a super group of folks. Can't wait to see the "fruits of our labors". Thanks again for thinking of me. Keep me posted. Take care. 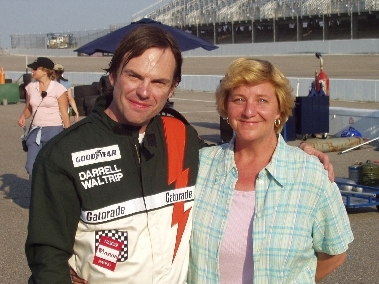 Best, Greg Thompson "D.W."
Greg with Jamie Artz on the set of "3 The Dale Earnhardt Story"
You can click on the small images above to ZOOM in.